The nerves are now kicking in! We have our first Tart catered event at our new space, in Belgravia on Eccleston Place, in a few weeks. And it’s a real big, important one. Standing on site at the moment it is hard to believe this is possible with constant crashing, sawing, drilling, bangs and mess of construction- ekkk- we are about to seat 200 for one of the chicest and most special events. Adwoa Aboah is co-hosting this with Felix Cooper for Save the Children, with an amazing committee, including the likes of Edward Enninful and the Delevigne sisters. This has to perfect, we need to ensure it’s a memorable and delicious evening. At first, we felt quite daunted by the culinary theme we were asked to do, that being Ugandan- our immediate thoughts were to filling curries and heavy spices- but this is not the case. We have been immersing ourselves in the culinary scene and rich history of Ugandan. From the ancient migration of the Bantu and Nilotic Africans to the arrival of the Indians to work on the Uganda’s railway network, the diversity of spices and skilled cooking methods because of this. We love all the inspired twists they put on traditional east African food from different cultural influences. We got inspired by certain ingredients and spices, and how we could develop those and put our own Tarty twist on it- from their staple plantain, turning this into a spiced chutney served with crispy coconut bhajis, to berbere (an aromatic mix of spices) marinated with heritage carrots caramelised in the oven and sprinkled with feta, chai and ginger also a big national favourite, and a favourite of ours, was fun to create chai meringues with a ginger and lime whipped cream. But the biggest revelation of all was cooking with hibiscus for the first time. Hibiscus can be ordered online, we used good old trusted Amazon, and many ways of using this dried flavour (which is filled with health benefits) lovely blitzed up with other spices and sumac to use as a marinade or even in a salad dressing. 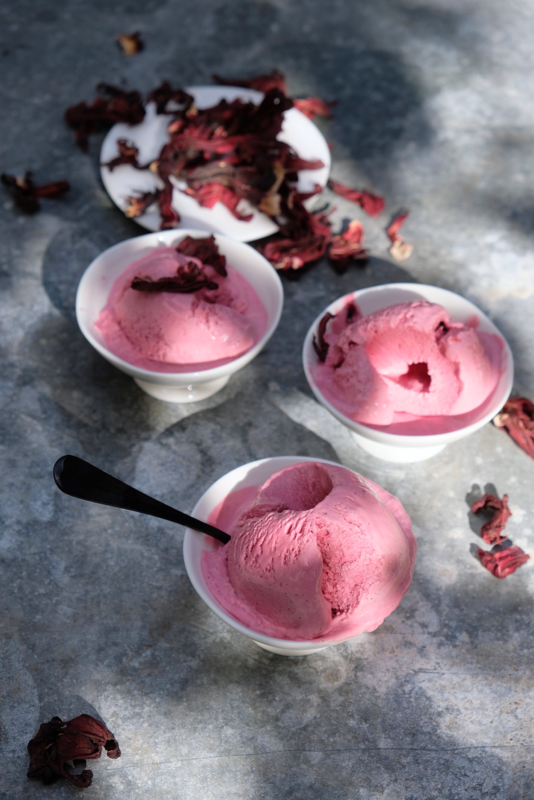 What an amazing flavour and beautiful colour, transforming an ice cream into the prettiest pink- and a taste that is complimentary infused into a vanilla custard base, tones that are floral and citrusy. This will be one of the four deserts brought out on the evening. In a sauce pan over a medium heat add the cream and milk with the scrapped vanilla and hibiscus-bring to the boil and then lower to a simmer for around 5 minutes to infuses, stirring to make sure it doesn’t catch. Take off the heat and let cool. In a bowl whisk the egg yolks with the sugar and honey until pale and creamy. Slowly pour in your milk mixture into the sugar and keep whisking, add the lemon zest and juice, with a few drops of rose water. Then pour back into the saucepan and keep on a low heat, stirring, until it thicken- thick custard on the back of a wooden spoon. Take off the heat and let it cool. Pass through a sieve, really pressing the flowers to get the last of the intense pink out. Pour into your ice-cream maker- and follow instructions. Would be lovely with toasted chopped pistachios on top.